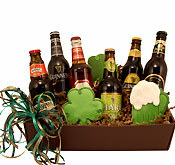 St. Patrick's Day is a holiday known for parades, shamrocks and all things Irish our brew gifts are created in the same spirit of celebration. 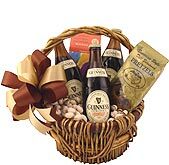 Created with flair and fun these St. Patrick's Day Beer Gifts include a variety of Irish beers, award winning snacks and shamrock cookies. Take pride in sending Irish Joy to family, friends, clients and staff. A bit of history about Ireland's long history of Brewing. By beginning of the nineteenth century there were over two hundred breweries in the country, fifty-five of them in Dublin. 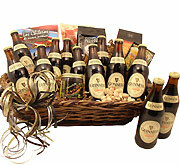 During the nineteenth century the number of breweries fell to about fifty, and today only about 12. From it's golden history Ireland produced ale, without the use of hops as these are not native to Ireland. Even in the late 18th century hops were not used, when almost all other countries had adopted the use of them as an ingredient to preserve and flavour their beer. 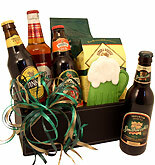 The Irish keep the history up to date with unique types that are featured in our St. Patrick's Day Gift Boxes. 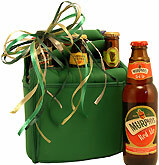 A bit about the Irish Beers Featured in our St. Patrick's Day Gift Baskets: Murphy's Red Ale- A well balanced Irish beer with full bodied flavor offering a refreshing specialty flavor with hints of malt and caramel. Guinness Foreign Extra- A unique medium lively bodied brew with a total black body offering an aromatic punch. Flavors of spice, dark chocolate and bitter hops, green herbs, and earthy coffee grounds are present And provide great individuality for this pick. 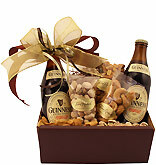 George Killian's Irish Red- Irish lager with caramel malts with a rich red color and distinctive taste. Smithwick's Irish Ale - Subtle aromas with a clean bite considered on the top of the charts for Irish beers. Don't let the initial sweetness of Guinness Black Lager tease you. While this dark lager does start out with a strong kick of roasted malts, each sip is guaranteed to end with a pleasant bite of bittering hops. Consider it an enticing drink that flirts a little and then gives you something to remember. The aroma will continue the game by delivering light touches of fruit and flowers followed by a roasted depth that sticks in your nose. You may notice the crisp and refreshing quality when you take that first sip, but the smooth, creamy mouthfeel is what will keep you stocking the fridge for future indulgences. 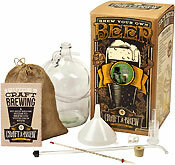 The brewers at Guinness implemented a cold-brewing process when creating their Black Lager recipe. They utilize high-quality Cascade and Saaz hops along with just the right does of roasted barley to create the strong aroma and layered flavor profile that is now one of their leading beers. While this black beer isn't available in the United States, it is pleasing taste buds in other parts of the world. When you can get your hands on a bottle, you may want to fill up the fridge and save it for a rainy day. Who doesn't need a gentle flirt and a kiss of hops from time to time? Do you like your beer dark, creamy and stiff with hops? 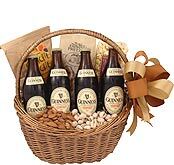 If so, you may consider Draught from Guinness one of your favorite brews. It pours into the glass with licorice black coloring all the way up to the creamy foam that rises to the head. While it kicks off with a bitter bite that comes from high-quality hops, the brewers balanced it out with sweet malts. There's a roasted quality to the flavor that may take you from gingerly sipping to heartily slurping one glass after another. With an ABV rating barely over four percent, this is one dark beer that gives you the freedom to enjoy more than one glass when needed. Keep in mind that Draught is a nitrogenized brew. This means that it's infused with nitrogen to smooth out some of the sharp pricks of carbonation. The brewers created a careful balance between the nitrogen and carbon dioxide, so you won't miss those little pricks entirely. The intensely malt aroma with overtones of coffee only make the drinking experience more rewarding, so consider Draught the perfect pick when you want something dark and smooth with a well-balanced flavor profile and just the right kick of carbonation.